Joy-sparking tulips in the garden of Tina Rousselot. For anyone who has read The Life-Changing Magic of Tidying Up by Marie Kondo, the KonMari method will need no introduction. For those who haven't, this soft-spoken Japanese woman and her clear, simple way of dealing with excess clutter has inspired people around the world to clear out anything in the home that doesn't "spark joy" and thus truly deserve to be there. The results are as dramatic as advertised; a home filled only with those things which fill you with delight, or practical objects for which you are very grateful. Though the home and garden are decidedly different spaces, there's no reason the method can't be adapted to the outdoors to help you create a landscape that is as fulfilling to your soul as your home. Here's how. Create a vision. Marie Kondo suggests first developing a vision, by writing down a paragraph about the type of lifestyle you'd like to live. In the landscape, you could start by figuring out how you want to interact with your garden areas, as well as how you'd like to feel when you look at, stroll through, or sit within them. then ask yourself, what's keeping you from actually using your garden that way? Do you need non-muddy pathways or a private patio to invite you outside? Would an outdoor heater make Humboldt's cool seasons more inviting? Is the view lacking in interest, or is it overwhelming and cluttered? For some people, the garden is a source of guilt. If chores and an unfinished to-do list greet you every time you go outside, you'll end up drawing the blinds against your garden rather than feeling it supports you in getting fresh air, enjoying social time with your family, and appreciating the beauty of the natural world. Whatever it is that keeps your garden from being the peaceful respite it should be, look for solutions that can be put into place with a minimum of fuss. While Pinterest would have you believe that a high-budget landscape loaded with all the features is what everyone dreams about, more often a simple, streamlined design with a few meaningful or beautiful focal points will bring you greater joy. Release anything that doesn't spark joy. In the landscape, people are often more focused on their pain points than they are on the small moments of beauty to be found, which is why it's important to declutter before redesigning. Though Marie Kondo recommends gathering all of your like items together (such as clothing, or books) and touching them one by one to see whether they spark joy in your heart, this is impractical in the garden – you're hardly going to dig up a bunch of shrubs or lug all of your pots to a central location to see for yourself the sheer quantity you've amassed. However, there are some obvious places to start. Get rid of anything obviously problematic, exhausting, or overbearing. Perhaps it's that shrub that keeps growing up in front of your window despite yearly pruning, or the disease-ridden fuchsia that you keep hoping will get better with just one more spray. Kondo suggests thanking anything you discard for teaching you something – in this case about your tastes in plants, or what grows well in our climate – to help you let go joyfully and without guilt. Choose a select few pots or statues to keep. Pottery and little statues or trinkets seem to proliferate in the garden, and because these man-made objects contrast so strongly with the natural environment, each of them seems to call out for attention. When dealing with objects like this, declutter by deciding which ones you truly want to keep, rather than which ones to get rid of. It's a fine distinction, but will help you avoid hanging onto 20 unimpressive terra-cotta pots "just in case." Though some may disagree, I feel pots are best when they are as large and beautiful as possible, set singly or in small groupings on the patio or by a door. Given their stature as automatic focal points, they should be kept perfectly groomed through every season, which can translate to a lot of work primping, replanting and watering. Rarely do pots look good scattered throughout the garden. Statues, too, are best when they are large enough to have a real impact when viewed from a way off, and should be so well-suited to your personality that they make you smile every time you look at them. Edit out any experiments. Part of the joy in gardening is trying new things, and most of us have purchased one of something at the nursery to test, intending to go back and get more if it really worked out. But we often forget to remove any that didn't become a knockout hit. If you don't love a plant enough that you want to rush back to the nursery and find more to create a cohesive theme, consider whether it truly belongs in the joy-sparking garden you are creating. Singles of anything under 2 feet tall often visually read as clutter. Find your "click point." For some, editing out that which doesn't belong, and maybe adding a fresh layer of mulch, brings enough lightness to the garden that it's a pleasure to be in again. For others, decluttering is only the first step in figuring out what you love. When you see what is left after tidying up, you'll have new insights into what you actually like, whether it's the neutral tones and swaying motion of ornamental grasses, the bright colors and good cheer of a cutting garden, or the fragrance and flavors of edibles interspersed throughout the landscape. Whether decluttering or bringing in new elements, the goal is to find your "just-right click point," that perfect moment where you enjoy resting your eyes upon the landscape as a whole, and everything in your garden either brings you joy, or makes you feel grateful for the service it provides (like screening your bedroom from the neighbors). Here's how to get there. Be grateful for what you have. While your first impulse may be to wish for a new flagstone path, wooden arbor and an array of mature plantings, the KonMari method isn't about acquiring new things. Start by feeling deep appreciation for the things you already have that spark joy, and even if you can't afford to replace a functional but dull walkway just yet, by feeling thankful for the service it provides, you may begin to find its utilitarian looks are not without charm. Repetition is golden. Though inside your home, you wouldn't want five of the same picture decorating a wall, the landscape is viewed from a greater distance, so unless it's a large tree, it's rare that you would only want one of a plant you love because you simply wouldn't notice it. 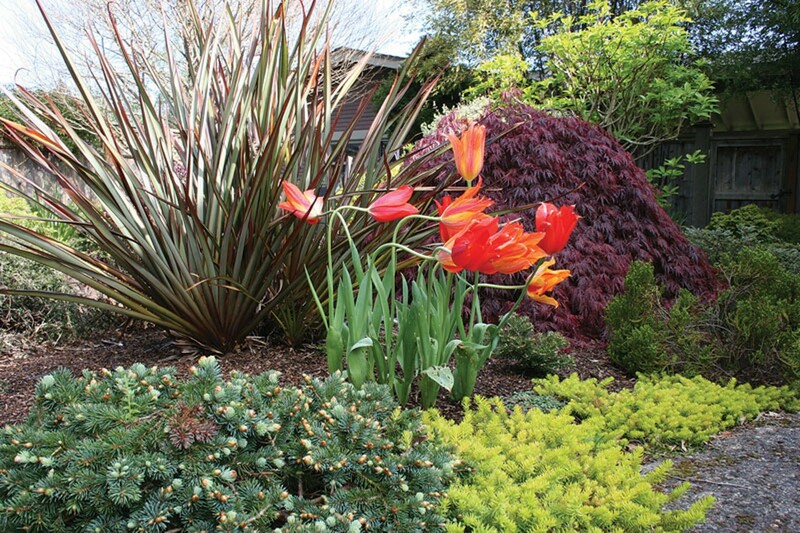 As a rule of thumb, the smaller a plant is, the more of them you should cluster to make a bold impact. When you paint with a broader brush stroke, it allows your focal points – the perfectly placed Japanese maple, small fountain, or colorful seating area – to shine. Structure your views. In the month of December I can count on my hands the number of times I've gone out into my own garden, and most of those trips were to collect vegetables and herbs. But I'll look out the window multiple times an hour to see if any buds have opened on my Camellia transnokoensis, or whether the resident hummingbird is perched on my vine maple. Given that, it makes sense to consider what you can see from indoors when designing, and especially to place winter-blooming plants within view of a window. Don't be afraid to hire help. If you need problem-solving advice for an area that just won't "click," most landscape designers are happy to come out for a paid consultation to give you a new way of looking at things. And though some people find happiness in puttering around the garden, for others it's just another thing that takes you away from your family and hobbies. If that's you, a skilled landscape maintenance crew can keep things weeded, pruned and healthy so you can focus on the joyful parts of having a garden. 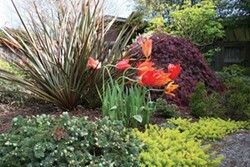 For a detailed monthly to-do list, visit www.northcoastjournal.com/GardenTodo. Genevieve Schmidt owns a fine landscape maintenance company in Arcata. Visit her on the web at www.GenevieveSchmidtDesign.com.